Although chili chocolate is not to everyone’s taste, it cannot be denied that it opens up a whole new world of taste experience. The characteristics of the ingredients complement each other perfectly and shape new flavour accents. 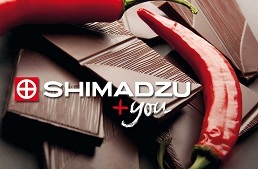 Shimadzu is a world-leading manufacturer of high-tech analysis systems for product safety and consumer protection. Our laboratory systems detect residues, ingredients and substances in product research and development, as well as in quality control. Medical equipment for diagnostic imaging complements our product range. Numerous world-premieres and awards demonstrate Shimadzu’s innovative strength. Currently there are no vacancies in our company.